Your teeth are designed to last a lifetime; however, there may come a time when you need a dental crown in Zionsville. By placing the protective cap over the tooth, you restore its health and function after it has suffered significant injury or decay. In some cases, they are used in preventive dentistry to protect a tooth from potential damage. Despite their many benefits, you do not want a dark metal tooth causing an eyesore in your smile. Now, crowns closely look like natural teeth, allowing them to also be used in cosmetic dentistry. At Trinity Dental, we provide the high-quality solution you need to enhance your smile. When it comes to dental crowns, there is no “one size fits all” restoration. You need one that matches your exact size and shape specifications to ensure it does not hurt oral functions or look out of place. In the past, your only option to receive a crown involved the use of metal. While they are very durable and effective, they were highly visible. To provide a more natural-looking solution, porcelain-fused-to-metal restorations were developed. These were metal crowns that had a porcelain cover. While they did look more like real teeth, they would cause a grey line to develop around the gum line over time. Now, you can benefit from an option that looks and feels natural with all ceramic restorations. Not only can they be made to match the exact size and shape specifications you need, but they can also be customized to your enamel color for a flawless smile. As your dentist in Zionsville, Dr. Angelo Julovich provides high-quality restorations that look natural. After preparing your tooth, an impression is taken, which is needed to create your custom-made crown. It will then be made from a single block of ceramic material. After it has been carefully milled, it is bonded to your tooth. 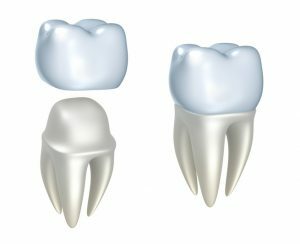 When compared to crowns from the past, ceramic restorations are equally as durable. With the right care, they can last an average of 10 years or more before needing replaced. In addition, they are made from a biocompatible material, perfect for those with metal allergies. Due to their high level of customization, they can be used for a wide range of dental procedures. In addition to restorative procedures, they are now commonly used in cosmetic dentistry. If you have a tooth that suffers from severe discoloration or is abnormally shaped, a crown is the perfect solution to enhance its appearance. They are also used with tooth replacement options, like dental implants and a dental crown. You will fill the missing space to regain a complete smile with an option that looks like a natural tooth. At Trinity Dental, we believe your smile should be healthy and beautiful. To give you the best of two worlds, we provide all-ceramic restorations. If you are ready to improve the appearance of a tooth with a natural-looking solution, it is time to schedule your consultation with Dr. Julovich. He will ensure it blends in with your natural teeth to smile with confidence.